Most of the power of the GoPro HERO5 Black, but half its size, makes the HERO5 Session a great choice when you’re looking to carry a little less camera without sacrificing a whole lot of quality. Not only can you mount it using a wide range of accessories, but you can wear it on your lapel like a corsage and capture the world with this incredibly portable camera. Stunning 4K capture, along with one-button simplicity makes this waterproof powerhouse a force to be reckoned with. Stunning 4K recording: Capture 4K video at 30 fps as well as 2.7K at 48 fps for ultra high-resolution video. Expanded modes: Added Time-Lapse, Night-Lapse, and Night Photo modes expand the possibilities for creativity. Impressive HD video: Record HD video at up to 1080p (progressive) up to 90 fps for capturing maximum detail. 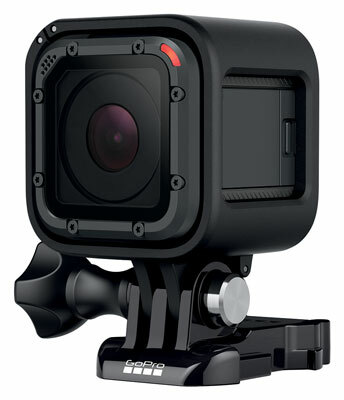 The higher frame rate also provides the best quality applying slow motion in GoPro Studio. Protune for photos: Provides the same control over still photographs as you have for video. Change the ISO setting, use exposure compensation, or adjust white balance on still images and time-lapse sequences. Built-in Wi-Fi and Bluetooth: Allows you to control the camera remotely through the Wi-Fi remote and the GoPro App. It also enables auto upload to your optional GoPro Plus Cloud account.